Immunofluorescent staining of a blistering lesion differentiates dermatitis herpetiformis, which is treated with a gluten free diet, from pemphigoid, which requires corticosteroids and often immunosuppressant drugs. This is suitable for larger lesions and is taken across the margin of the lesion in the form of an elipse. It is essential to include deeper dermis, as the significant changes in, for example, granuloma or lymphoid infiltrate may not be near the surface. An adequate amount of normal tissue should be included, so this could be compared with the pathological area and this also means there is enough normal skin to suture the incision together. The biopsy tool consists of a small cylinder with a cutting rim which is used to penetrate the epidermis by rotation between the operator's finger and thumb. There is minimal danger of damaging deeper structures as the elastic subcutaneous tissues merely rotate with the tool without being cut. The resulting plug of skin is lifted out with forceps and cut off as deeply as possible. With the smaller sized punches the resulting defect can be treated with electrocautery or left to heal spontaneously. With a punch larger than 3 or 4 mm a single suture can be used. The main disadvantage of a punch biopsy is that it only provides a single small piece of tissue. It may not be representative or may miss an area of substantial change. It tends to leave a more prominent scar than the incisional biopsy. Excision of skin lesions is both curative and diagnostic. It may be the best way of making a diagnosis if there are multiple small papules or vesicles, one of which can be excised intact. Incisions should follow tension or wrinkle lines. In the case of malignant lesions it is particularly important that the whole lesion is adequately excised. The pathologist can report on the adequacy of excision, but not in multifocal basal cell carcinoma where this cannot be assessed. If there is likely to be any doubt about the excision being complete it is helpful to attach a suture to one end of the excised specimen so the pathologist can describe which border, if any, extends over the excision margin. The basic technique consists of making an elliptical incision with the length three times the width. This enables suturing without the formation of "dog ears" at the end. The long axis of the excision should follow the "wrinkle lines" of the skin, which are parallel to the collagen bundle in the dermis. 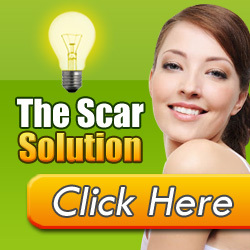 This produces stronger, narrower scars. They are not the same as the deeper lines or fasical attachment or "Lange lines". Lesions on the sternal area, upper chest, and shoulders, where keloid scars often form, should only be excised when it is essential and may be best referred to a plastic surgeon. Local anaesthetic is injected subcutaneously but close to the skin. The incision should be vertical rather than wedge shaped. 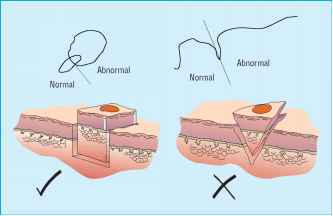 Monofilament sutures cause less inflammation and trapping of serum than the braided variety, but are harder to tie securely. Methods of suturing and the more specialised techniques of flaps and grafts are outside the scope of this book. It is an asset for the dermatologist to be able to carry out surgical procedures on the skin and suitable courses are generally available. Is histological biopsy enough to diagnose lupus?